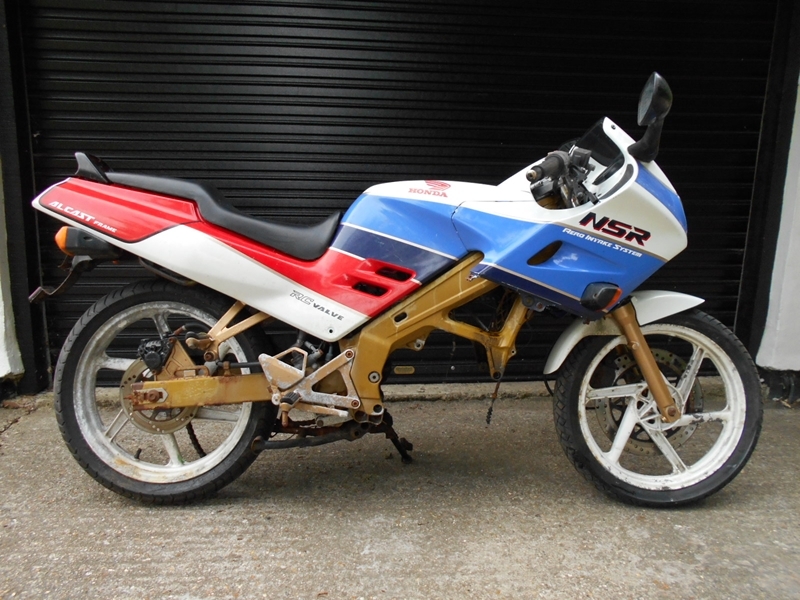 This 1992 Honda NSR125R-K Full race replica was brought to us a while back in the usual tattered, uncared for condition. This JC20 Model is one of the last ever models of the NSR range to be a Full Power 125cc Motorcycle they were most famous for, said to produce 33 bhp and keeping the traditional twin glass circular headlights at the front, multi-spoke alloy painted rims, front and rear discs and the famous AL-CAST 2 piece frame that made for an incredibly lightweight bike back in its day – and of course, to be enjoyed once again. 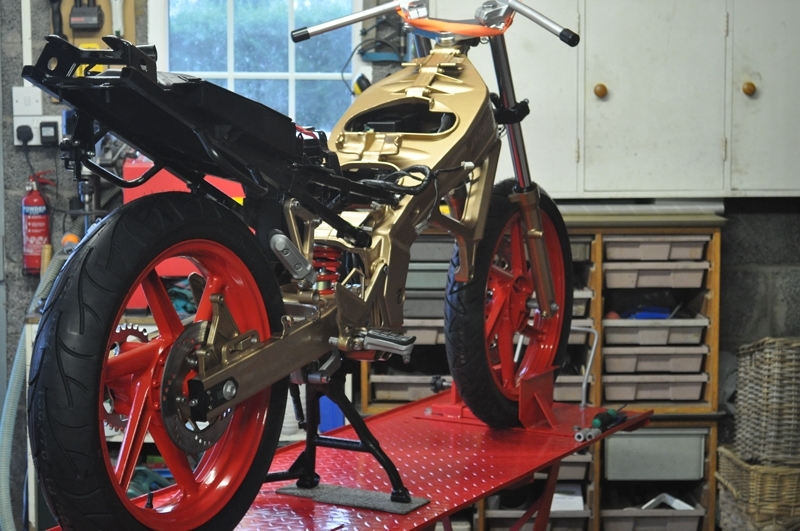 Our Honda NSR was taken off the road in early 2006, was sold to us as a rolling frame with rather beaten up panels in a box along with a very sad looking engine. 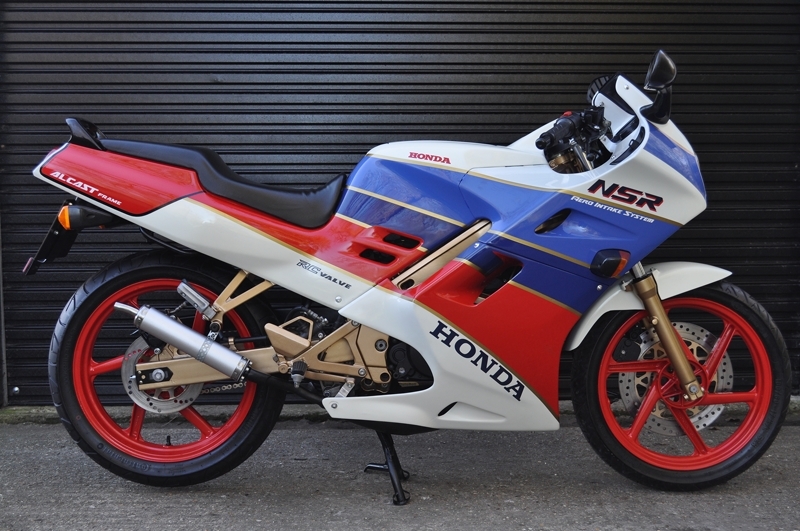 The build of the NSR was rather simple; with the usual Honda’s high standards in regards to suspension linkages, general frame quality and intricate plastic mouldings. We started by stripping down the rolling frame taking note of any major parts that were missing at this point, worked through logically until we became comfortable with what we had. Changing almost every bolt to A2 stainless for longevity and extra class has definitely made a difference to the bike we picked up. Refurbishing many parts to almost new condition but then replacing anything that left our NSR looking old and tired. Replacing both piston and little end ensured maximum compression in an already great barrel. A brand new set of clutch plates will ensure that power gets to the rear wheel, whilst flushing through with quality oil will keep the gears in good order. Engine lubrication is not left to chance, so Silkolene 2T Race Oil which ensures a great start when running in this fantastic rebuilt engine. This fully de-restricted engine produces over double the output power allowed under today’s UK motorcycle restriction law for anyone of the age of 17. But who can complain, as this bike is completely original, pumping out an impressive 30BHP at the Crank and 26BHP to the rear wheel. So, here we have a great little motorcycle ready to be ridden once again or to keep for the future. Whatever you decide to do, you know that everything inside those fairings has been meticulously refurbished up to Lacey’s Motorcycles high standards. Hiding the hard work put into this bike made us put together a few photos showing you a glimpse of the detail and excellence that has gone into building this time consuming, yet well delivered bike. Full Valet, 70 point Check, Fresh MOT and 12 Months (1 star) extendible Warranty.